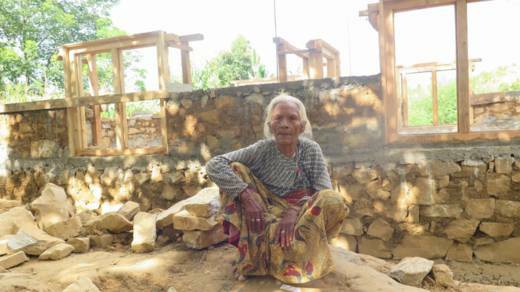 CAFOD’s partner, Caritas Nepal, has helped 80-year-old Krishna Kumari rebuild her home after it was reduced to rubble by the April 2015 earthquake. Two years on, families whose homes were damaged or destroyed by the 2015 Nepal earthquakes are now moving into their new earthquake-resilient homes. “Progress is being made to rebuild and recover. We are thrilled to report that thousands of families across earthquake-affected areas have now received reconstruction grants and re-building is underway. “Our humanitarian response includes supporting local partners to run training workshops with people from affected communities, so they can build safer homes that can withstand earthquakes,” added Giovanna. Those involved in the relief and reconstruction efforts in Nepal have faced many challenges over the last two years, including monsoon rains blocking roads, fuel shortages and price hikes due to blockades along the Indian border, as well as delays in establishing the government’s National Reconstruction Authority that coordinates housing reconstruction. Despite these difficulties, Giovanna said: “From the darkness of the disaster, communities are building back better and safer”. Our local Church partner, Caritas Nepal, supported Krishna to register for government shelter support, and her new home was built for her as part of their earthquake-resistant construction training scheme for local masons. Krishna’s new home has all the required construction techniques for a safe home, such as banding at the windowsill, plinth and roof levels, and a strong building shape. 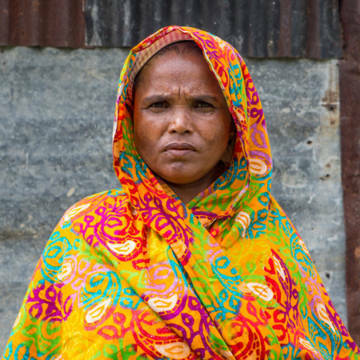 “Shaking will never make any difference, it is an earthquake-resilient home,” said Krishna. It will take many years for Nepal to fully recover, but we are helping people rebuild their lives for the long term. As well as the safer homes rebuilding projects, we have also supported local partners to rebuild schools, repair damaged water systems, and help communities restore their means of making a living, for example through re-establishing agricultural and livestock work. Our partners have also been working in communities to help people be better prepared for any future disasters. The 2015 earthquakes were disasters on an enormous scale. Thanks to your donations we raised over £3.9 million through our Nepal Earthquake Appeal, enabling our Church partners to reach hundreds of thousands of people affected by the earthquakes. Giovanna Reda said: “The generosity and compassion shown by our supporters has enabled our partners to restore dignity of the people affected and help those who survived the earthquakes to rebuild and prosper”. Krishna Kumari’s new earthquake-resilient home.